Danish studio CEBRA has redesigned a science centre in Copenhagen, adding a shimmering copper-clad staircase that represents the structure of a DNA strand. CEBRA won an international competition in 2011 to oversee the refurbishment of the Experimentarium, which seeks to engage with young people and showcase the wonders of science. The building is located in the harbour of Copenhagen's Hellerup district and was formerly a bottling plant operated by the Tuborg beer company. The architectural project focused on expanding and improving the centre's facilities, including doubling the available exhibition areas to accommodate 16 interactive exhibits. Another key aspect of the project was enhancing the connection between the building and the city, which is partly achieved through huge expanses of glazing incorporated into the main facade. "The aim of the design is a radical change of Experimentarium's architectural expression," said CEBRA founding partner Kolja Nielsen. "From previously being an introvert building to now appearing as an extrovert, engaging and vibrant attraction." A stacked configuration of staggered rectilinear volumes that are offset from a brick plinth expresses the various functions of the internal programme. The brick base was preserved from the original building, providing a tangible representation of the connection between past and future, as well as between natural science and engineering. The upper volumes are clad with lightweight aluminium panels featuring a perforated pattern based on the way air and fluid behave when they encounter resistance. 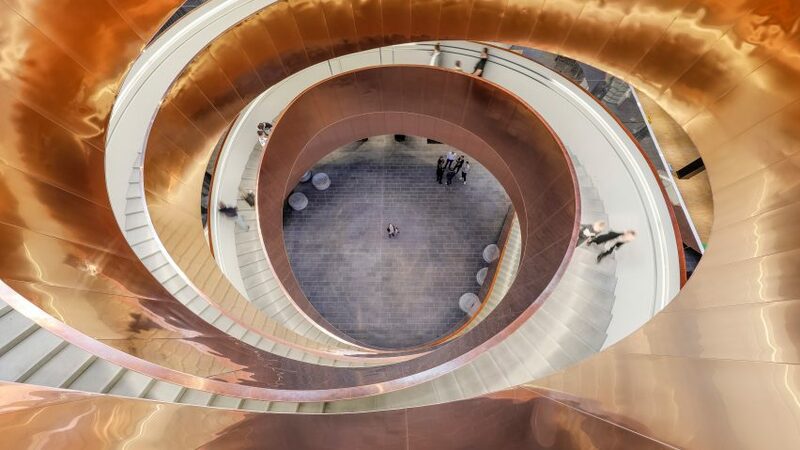 Another element intended to reaffirm the building's scientific remit is the dramatic copper-clad Helix staircase, which is located just inside the entrance and can be seen by passersby on the street. "The staircase ensures a good internal flow and creates coherence between the floors," said Nielsen. "At the same time, it substantiates the building's scientific focus." "During a workshop with Jakob Bohr, professor at DTU Nanotech, we were inspired to work with the stairs as an abstract version of the DNA strand's structure," the architect continued. "And so, the idea for the Helix staircase was born." The sweeping staircase is 100 metres long and ascends to four separate floors. It was produced from 160 tonnes of steel and is clad with 10 tonnes of copper. 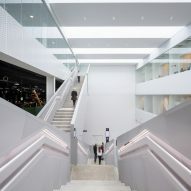 The refurbishment also provides the Experimentarium with a large publicly accessible roof terrace, improved staff facilities, a cafe and picnic area, a convention centre, teaching spaces and several workshops. CEBRA's previous projects in Denmark include a school with jagged roofs and stripy green walls, and an adult learning centre featuring forms inspired by drawings of Disney characters.